My students are currently in a personal narrative unit. Last week we worked on rough drafts, this week they are polishing those up to become their final drafts. As always, I wrote along side them. I told my students to pay attention to the story that was begging to be told. I knew what mine was - swimming. After being on swim team for years, and swimming off and on since the early 90s, I have found regular swimming once again. 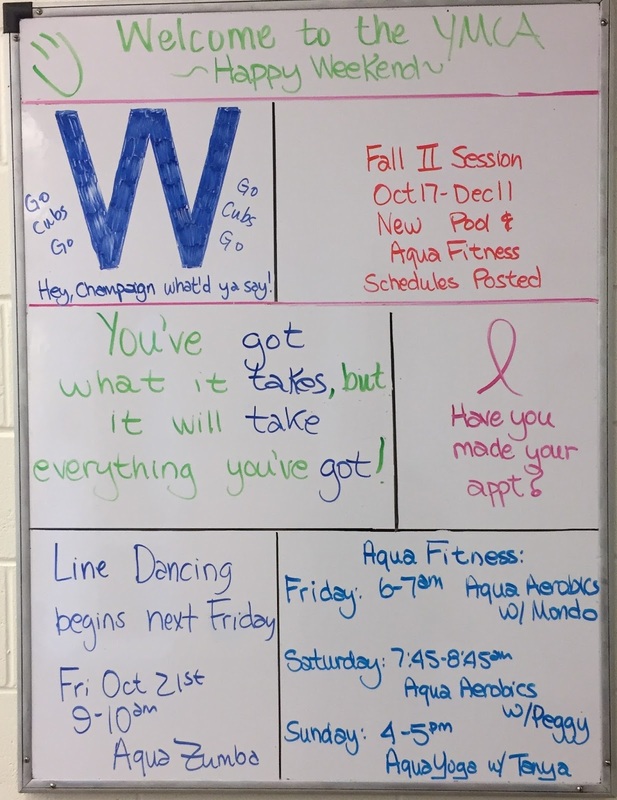 Once or twice a week - sometimes more - I head to the nearby town and go to the Y. I love the Y. I love the whiteboard with a positive message before the locker room. I love the people that work at the front desk. I love the older ladies that swim and tell me that I'm doing a good job. I love the college swimmers that I shared a lane with Sunday. My dearest wish is that there was a Y in my town, but there isn't, so I drive the 20+ miles and head there to unwind. At any rate, my personal narrative about swimming was the story asking to be told. Here it is, a slice of my life. I can't wait to read my students stories this week. I slammed the locker shut, spinning the combination before walking away. My feet made a slapping noise against the floor as I hit the puddles left by swimmers from earlier in the day. It looked like an afternoon rain storm had moved through the locker room. Taking a deep breath, I pushed through the door and walked on to the pool deck. I started swimming at an early age. At first, I hated putting my head under water. It made my eyes hurt. My swim instructor tried to be tricky and would ask me to pick up rings off the bottom of the pool, necessitating me to put my head other. I would have none of that, and instead would grasp the rings with my toes, bring it to my hand, and avoid the dreaded dunk of my head. One day, though, I finally did it. I remember putting my head under, looking around, and wondering why I had a made a big deal about this for such a long time. I became a swimmer and never looked back. In grade school and high school, I swam. Swim team was where everything else melted away. No one could bother me in a pool. Noise evaporated. Problems disappeared. I would pull myself up and down the lanes, lap after lap, and find my true self in the water. Coming back to the pool deck, I scanned the lanes. 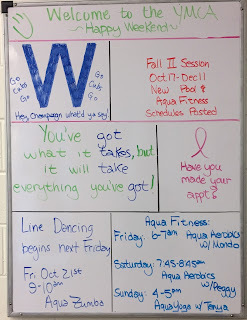 The Y was busy today. The afternoon light was slanting through the windows, shining down on the eight lane lap pool. I quickly jumped into lane four, asking the older man standing in it if he wanted to split the lane. “You okay with taking the right, I’ll take the left?” he asked. I nodded and pulled my pink goggles over my eyes. Taking a deep breath, I dropped below the water, my legs pushing off against the wall. Woosh. Bubbles shot by me as my arms reached out. I surfaced and then began to pull through the water, arms slicing through like a knife. The rhythm soothed my brain. As the number of laps racked up, stress left my body. In the pool I wasn’t forty-two, mother of two, teacher to many. In the pool I was my true self, the person I remembered from thirty years ago. Here I was home. I was doing this just for me. Every five laps, I’d take a break and look at my time. I exhaled in frustration. I had began swimming again in July. Then it took me an hour to swim 20 laps. Now I was down to just under thirty minutes, but it still felt slow. Where was the speed from years ago? How long until I felt like I was getting it? “You bet I did,” he replied. “Any day I am out here, doing the work, I consider it a win.” With that, he pushed off and kept swimming. I paused, letting his words sink in. I was out here doing the work. That should be enough. My swim partner was right, I was being ridiculous. Pulling my goggles back on, I glanced to my right. Lanes five through eight were taken up with the Heat swim team. I watched the kids race up and down the lanes, high fiving their friends, slipping back underwater with ease. I miss those days, but realized with a smile that I am grateful to be exactly where I am. I love my life and am deeply grateful to have reconnected with this sport I love. With a deep breath I dropped back underwater, pushing off from the walls, and began again. Du Iz Tak? is crazy good. Like going in my Mock Caldecott wish list kind of good. Ditto to Snow White and We Found a Hat. Heck, several on this list are unreal, they just rock. Ashes was beautiful. If you haven't read the first two in the trilogy - Chains and Forge, well, go out and get them. Stop reading this post. They are unreal. We've waited, and waited, and waited for this final book. It was worth it. My favorite part was putting it on my easel one day. A former student who I don't even have this year popped in to say hi, then screamed when she saw it. She asked if she could have it, which of course I gave it to her. Then it was returned, only to have a similar impact on another student the next day. She has it now. I freaking love this series. And, not exactly related, my students have been busy. You can find them sharing the reasons they write for the national day on writing here. 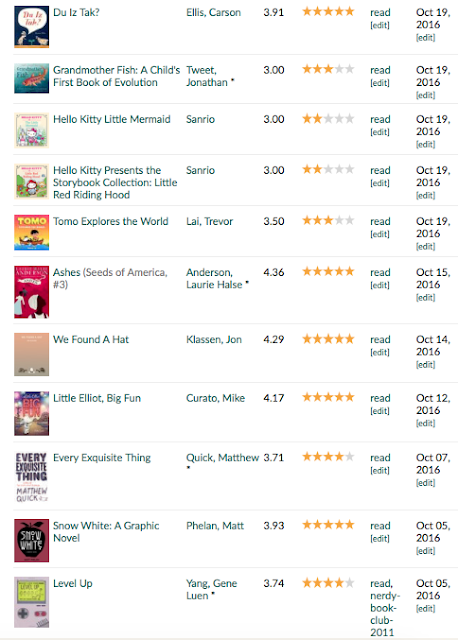 And a few of them sharing book recommendations on Voices From the Middle's podcast here. Inspiration can come in many forms. I'm inspired on a daily basis by my husband, parents, colleagues, students, and - importantly - my sons. 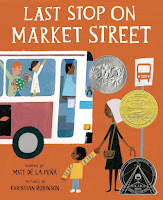 Today I shared with my three classes of seventh graders one of my favorite picture books, Last Stop on Market Street. 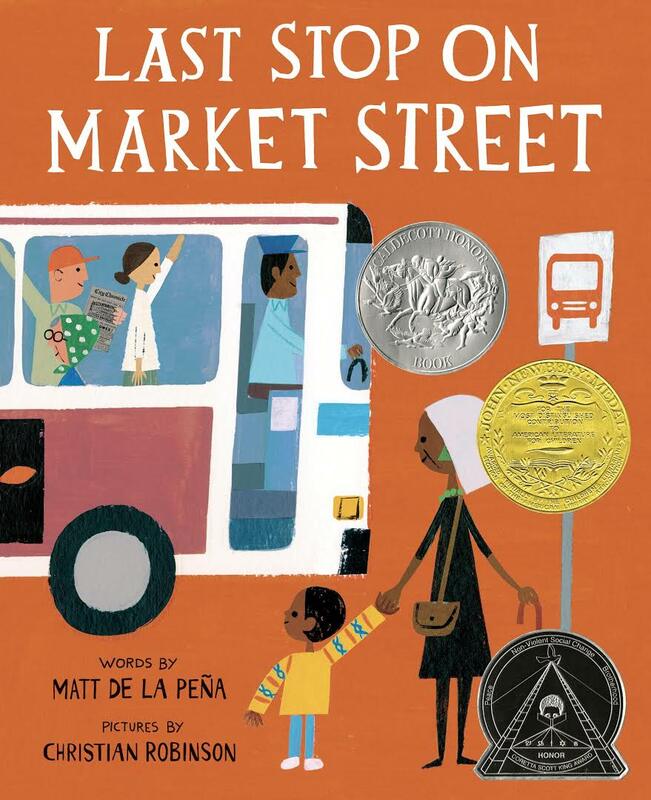 I love this world that Matt de la Peña lets us into. I love the illustrations Christian Robinson creates. We read it as part of our personal narrative unit. I want my students to see that stories are all around us. After each mentor text, we're doing a quick write. Kids can write about what the story was about, something it inspired, a poem they create after hearing it, anything. I put the timer on for three minutes and write with them, projecting my notebook under the document camera as my pen flies across the page. I never plan out what I'm going to write, and it's a different entry with each class, but it's always whatever is on my heart. CJ's nana looks for the good in everything, and I admire that quality in others. One of the people I see this in, that I look up to myself, is my son, Liam. 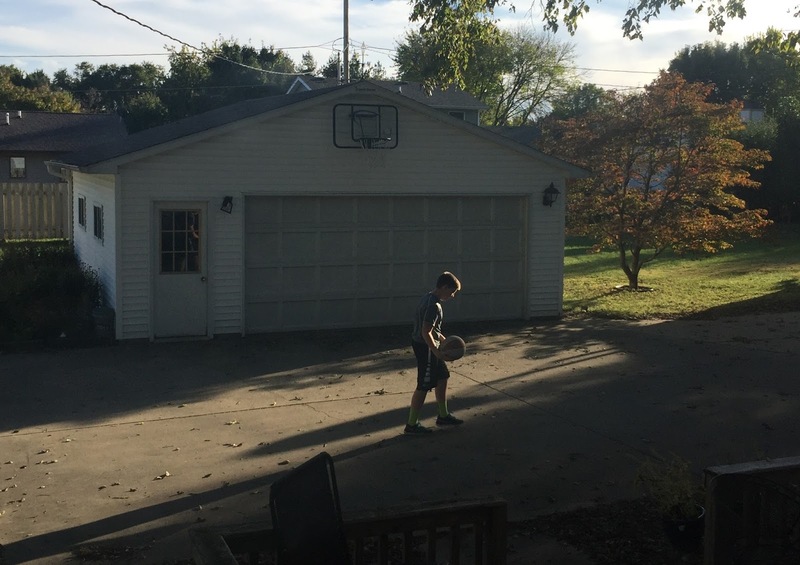 Liam found out yesterday that he didn't make the basketball team he tried out for. He had worked hard after being cut last year, put in many hours, but it just didn't work out. I admire Liam greatly for the simple fact that he continues to persevere. That he pushes himself to try again in the face of failure. That upon being told that he didn't make it he immediately asked if he could join the YMCA's team again and quickly said that he hoped his friends had made the team. On a daily basis, Liam looks for the positive in life, just like CJ's nana. He finds good in what could be seen as bad. Each and every day I try to just be a little more like him. My students were quiet when I shared my story, Liam's story. I asked them not to flood him with comments about how they wished he made the team, or that they were sorry he hadn't, because I knew he wouldn't want that. He had been sad last night, but he was over that today and wanted to move on. What I wanted was for them was to see how we can use books to connect, to teach us who we can become, to remind us of the good in others. My boys often inspire me, and I love to show that to my students. All too often kids think we don't notice them, but I see the good in others through their daily actions. I hope they can see that in me too. Liam after school today, back at it. Hmm, a bit behind. I attended IRC's annual conference on September 29th and 30th September 30th I posted reflections from day one and now it's...October 9th. Oops. I had good intentions for day two's reflection, but the past week has gotten in the way. We began on the 30th with an early morning (6am) drive to Peoria so we could start our day with Jason Reynolds. I've read several of Jason's books with Ghosts being the most recent one. My students loved it, even if Lizzie wasn't thrilled with the ending. I wanted to hear Jason, meet him if I had a chance, so that I could bring that back to my students. I unfortunately didn't get a chance to meet him, but was spellbound by his quiet stories for sixty minutes. Listening to Jason talk about the influence of poetry on his life, of Langston Hughes and Queen Latifah, of the poetry of hip hop music, of the beauty of allowing yourself to be you, I was swept away. Jason is not someone I'm going to forget anytime soon. I want to surround myself with every book he has written, soak in the words, and grow from there. Then we headed over to see my wonderful friend, John Schumacher, give a presentation on being reading ambassadors. I love John's enthusiasm for children's literature. I am always struck by the positive message that exudes from every bit of him. I smiled as he shared favorite titles and scribbled down any I didn't know. What a fabulous way to spend an hour. Our last two sessions were with Kelly Gallagher. He had a session before lunch about reading and one after lunch about writing. I loved how he has his students examine articles for bias. He asks them what the passage says and what it doesn't say. He went into this over and over. I think it is of critical importance. My students tend to believe anything they read, they don't pause to think about bias or persuasion. Heck, judging from my Facebook news feed, adults don't really think about this either. It infuriates me. Critical thinking seems to have gone the way of the dodo. I want to bring it back. These two questions, What does it say? What it doesn't say?, are going to be ones I incorporate into the Article of the Week. Our seat to hear Kelly the first time, the floor. In writing, Kelly talked about the four things students need to be better writers: volume, choice, modeling, and conferring. Writing is an area I need to grow this year, so this was good for me to hear. I did quick writes all the time in fifth grade, but I've gotten lazy about them in 7th, only doing two a week. Heading back to daily ones next week. I loved how Kelly graded those - he collects notebooks after a certain amount of quick writes. There's a list on the board of the ones they've done since the last collection. You get points for each being present in your notebook, but then you put a post-it on the one you want him to read. Love it. Beyond that, I cannot wait until the book he and Penny Kittle are working on comes out. Sounds like it will be amazing. And that wraps up two days of learning! I'm so grateful my district recognizes the benefit to attending conferences like IRC and NCTE. 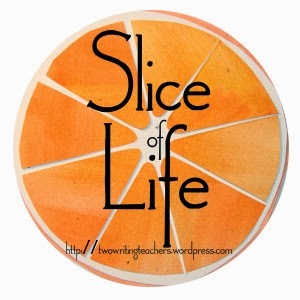 Each time I go I'm not only rejuvenated, but ready to try something new in my classroom. What a blessing! 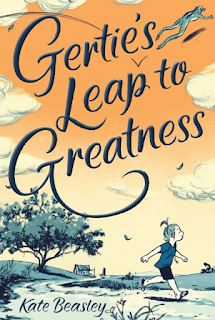 When I was asked if I wanted to be part of the blog tour for Gertie's Leap for Greatness, I said an immediate yes. My schedule is insane, scheduling posts right now is a nightmare, but this book has my heart. Anytime an author can get a first line like this, I'm in love. Then there are the characters - enemies with names like Mary Sue Spivey, loyal friends like Junior, and family like Aunt Rae with her, "Give 'em hell, baby." And then there's Gertie. Gertie is a character I wanted to pull close, give her a hug, and watch her take on the world. Her mom decided she didn't want to be a mom when she was young, but still lives in the same town. 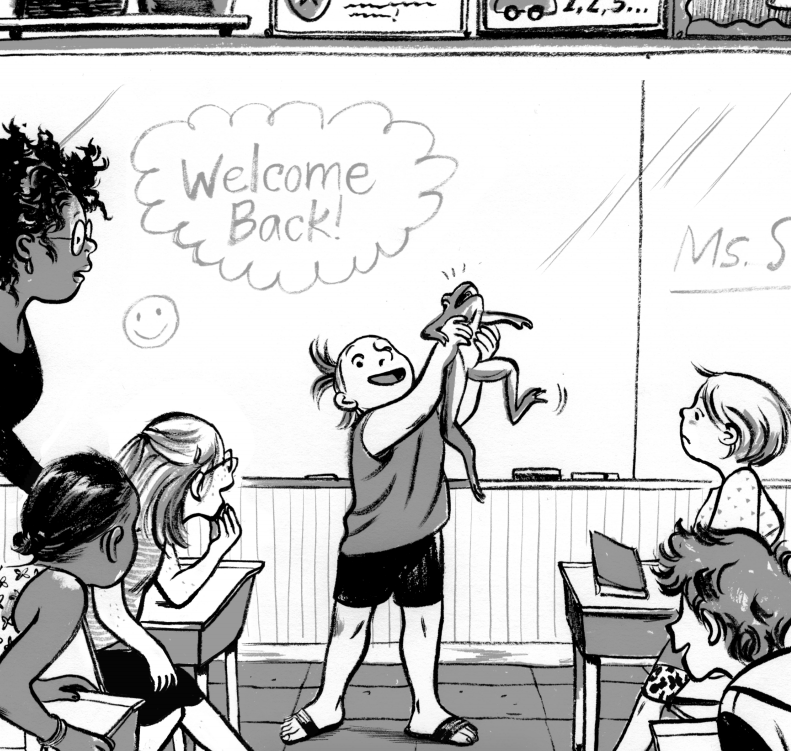 Now that her mom has put her house on the market, Gertie has decided she needs to be the best fifth grader in the universe to prove that she doesn't need her mom. Unfortunately there are people like Mary Sue standing in the way. At her core, Gertie is a loyal, kind, and proud kid. She reminds me of my favorite character growing up - Ramona. I loved this story with everything in me. MacMillan was kind enough to send me two copies of the book - one for myself, and one for someone who is "great like Gertie." In their words, someone who goes above and beyond to be great, not just for themselves. (And if they happen to love kids books, so much the better.) Well, I'm thrilled to pass a copy on to my colleague, Leigh Anderson. Leigh absolutely loves kids books, her Facebook feed shows what she's reading on a regular basis. 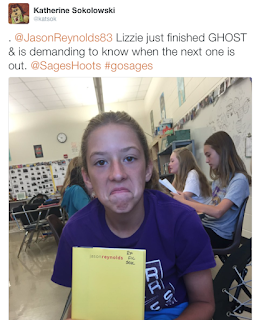 She champions fabulous books and shares them with her sixth graders. What also makes Leigh "great like Gertie" is her love of dogs, specifically King Charles Cavaliers. We share a love for the breed, but Leigh has gone above and beyond. She's had many of these wonderful dogs, some from rescues. Her heart and love for animals could fill our school and I am certain she will love Gertie if she hasn't read it yet. 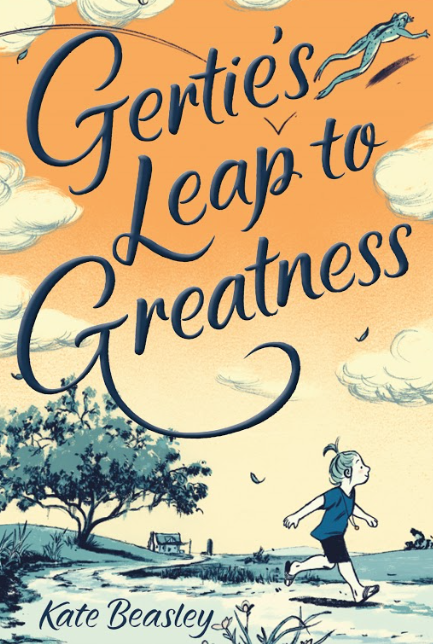 Gertie's Leap to Greatness was released this week. Go check it out! YIKES! 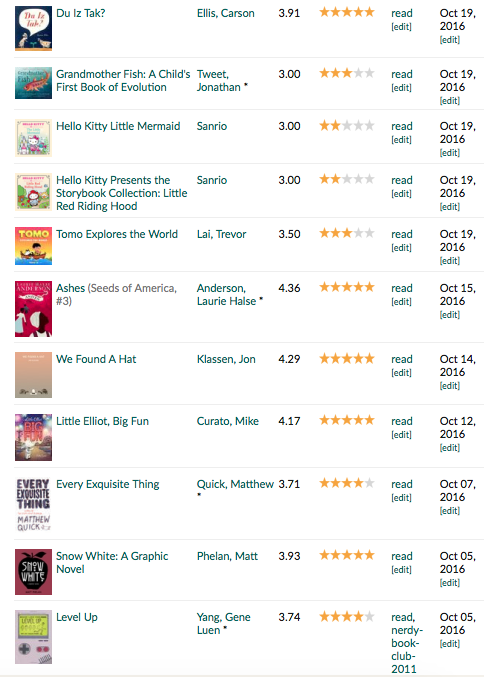 Somehow I didn't share what I was reading on my blog even once in September. Not sure how that happened. I think in starting a new grade level this year I've been a bit more busy, a bit more preoccupied, than I realized. My goal this year was to share every book I read here, to have a record of it. So, without further ado, here is my September reading round up. 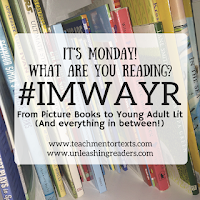 Here's what I love in reflecting back over this month of reading. 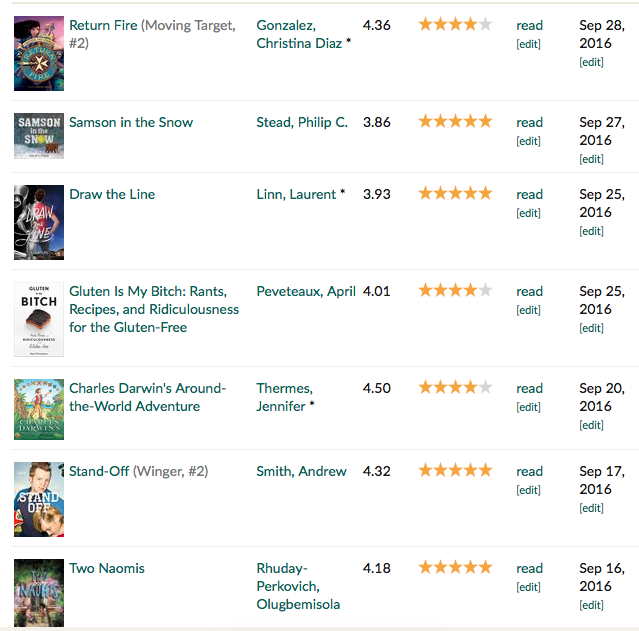 I can see my new job in it - the tons of romance books early in the month, the new favorite YA books of Stand Off and Draw the Line. 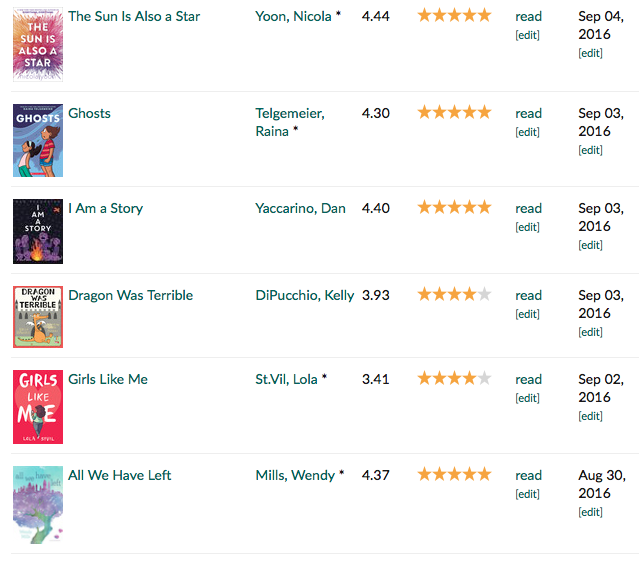 But I can also see the books I've read for the past 20 years in education at the elementary level - the picture books that I still bring into my new 7th grade classroom, the copy of Dog Man that I bought because I knew some kids would love to see it, Raina's Ghosts, etc. 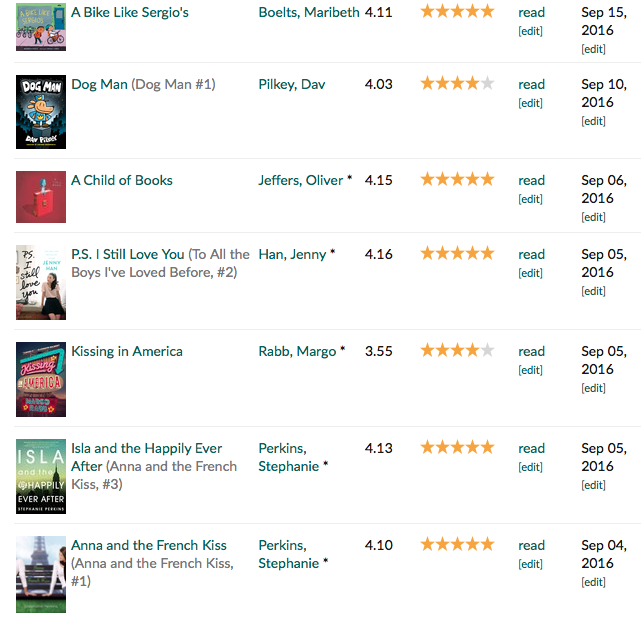 I've absolutely slowed down on my reading since the summer, but still managing to squeeze in a bit here and there. I'm currently reading Bird by Crystal Chan in preparation for an author visit. It is wonderful so far.